FROM THE REVIEWS: ¿Webb offers coherent, understandable, and sometimes humorous coverage of a diverse range of topics. He provides readers with non-trivial insights into research fields they may not have encountered previously . . . 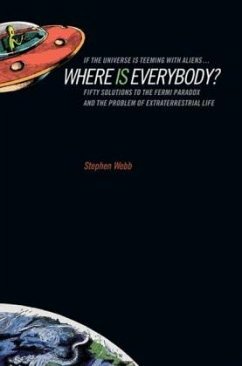 I think everyone who has ever considered the possibility that other intelligent civilizations exist elsewhere within our galaxy will enjoy Where Is Everybody? They will find much to agree with, and much to argue about, in this very accessible volume.¿ ¿SCIENCE During a Los Alamos lunchtime conversation that took place more than 50 years ago, four world-class scientists agreed, given the size and age of the Universe, that advanced extraterrestrial civilizations simply had to exist. The sheer numbers demanded it. But one of the four, the renowned physicist and back-of-the-envelope calculator Enrico Fermi, asked the telling question: If the extraterrestrial life proposition is true, he wondered, "Where IS everybody?" In this lively and thought-provoking book, Stephen Webb presents a detailed discussion of the 50 most cogent and intriguing answers to Fermi's famous question, divided into three distinct groups: - Aliens are already here among us. Here are answers ranging from Leo Szilard's suggestion that they are already here, and we know them as Hungarians, to the theorists who claim that aliens built Stonehenge and the Easter Island statues. - Aliens exist, but have not yet communicated. The theories in this camp range widely, from those who believe we simply don't have the technologies to receive their signals, to those who believe the enormities of space and time work against communication, to those who believe they're hiding from us. - Aliens do not exist. Here are the doubters' arguments, from the Rare Earth theory to the author's own closely argued and cogently stated skepticism. The proposed solutions run the gamut from the crackpot to the highly serious, but all deserve our consideration. The varieties of arguments -- from first-rate scientists, philosophers and historians, and science fiction authors -- turn out to be astonishing, entertaining, and vigorous intellectual exercises for any reader interested in science and the sheer pleasure of speculative thinking. Stephen Webb is a physicist working at the Open University in England and the author of Measuring the Universe. In a 1950 conversation at Los Alamos, four world-class scientists generally agreed, given the size of the Universe, that advanced extraterrestrial civilizations must be present. But one of the four, Enrico Fermi, asked, "If these civilizations do exist, where is everybody?" Given the fact that there are perhaps 400 million stars in our Galaxy alone, and perhaps 400 million galaxies in the Universe, it stands to reason that somewhere out there, in the 14 billion-year-old cosmos, there is or once was a civilization at least as advanced as our own. Webb discusses in detail the 50 most cogent and intriguing solutions to Fermi's famous paradox. The 50 solutions to Fermi's paradox are divided into three major groups: I. They Are Here; II. They Exist, But Have Not Yet Communicated; III. They Do Not Exist. With Notes, Suggestions for Further Reading, and Index.